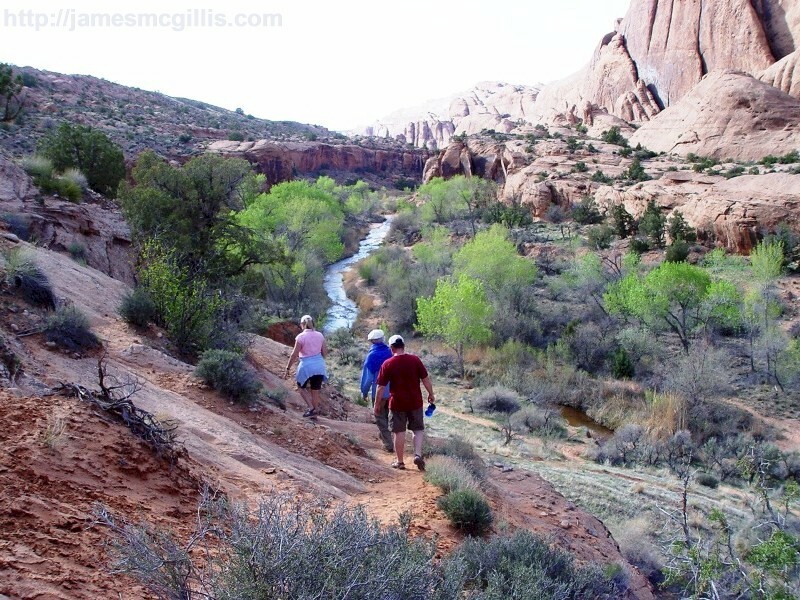 While in Moab, Utah during April 2009, I had the pleasure of hiking with my friends, Tiger, Terry and Leo. After taking an unmarked turnoff from the paved road, we proceeded uphill for another half mile. Later, when AAA came to retrieve our keys, which we had locked in our truck, Tiger described the turnoff to our locksmith as follows: “You know, up on the north side, where the Hanson boys used to live. Look for six poplar trees and then turn between the two houses. You will see us at the top”. Tiger Keogh is a native of Moab. In her youth, she and her friends ran free in this area. Each summer, she and her friends scaled the same ridge on which we stood, then camped out for a week along Mill Creek, in the canyon below. It was camping at its finest. If they wanted something, like blueberries for their pancakes, Tiger could run the two miles home, get what was needed and be back at camp before her girlfriends began cooking without her. Only locals and a few Moab aficionados know the area where we planned to hike. Until this late-afternoon hike, we knew Mill Creek only by the Mill Creek Parkway, which passes under Main Street within a concrete culvert. After consulting our topographical maps, we discovered that Mill Creek has its origins deep in the La Sal Mountains, to the east of Moab. The stream originates high on the western col of Manns Peak, near Mt. Mellenthin and Mt. Tukuhnikivatz. Chilled by snow-melt at that time of year, the creek water ran cold through our canyon, half way to its confluence with the Colorado River. At our location, behind the slickrock ridges, we found a peaceful canyon containing the best of what Moab has to offer in hiking trails. After a short, steep climb down to Mill Creek, we set off downstream to locate some of Tiger’s favorite Indian rock art sites, waterfalls and swimming holes. Late afternoon is always a good time for a hike in Canyonlands. With its unique energy and light, the afternoon sun enhances any Moab hiking experience. As the Sun’s rays glance in from a lower angle, spirits unseen at noon, show themselves as light and shadow. 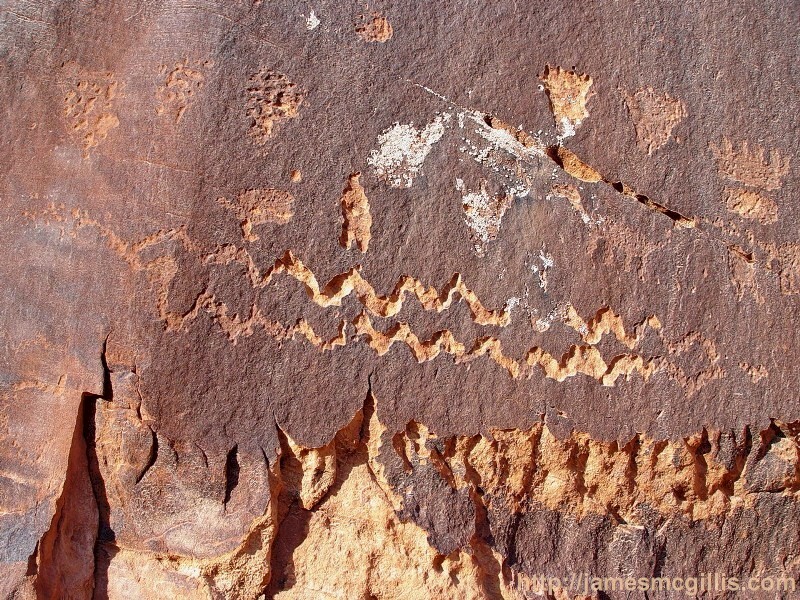 In quick succession, Tiger located several previously undocumented rock art panels. 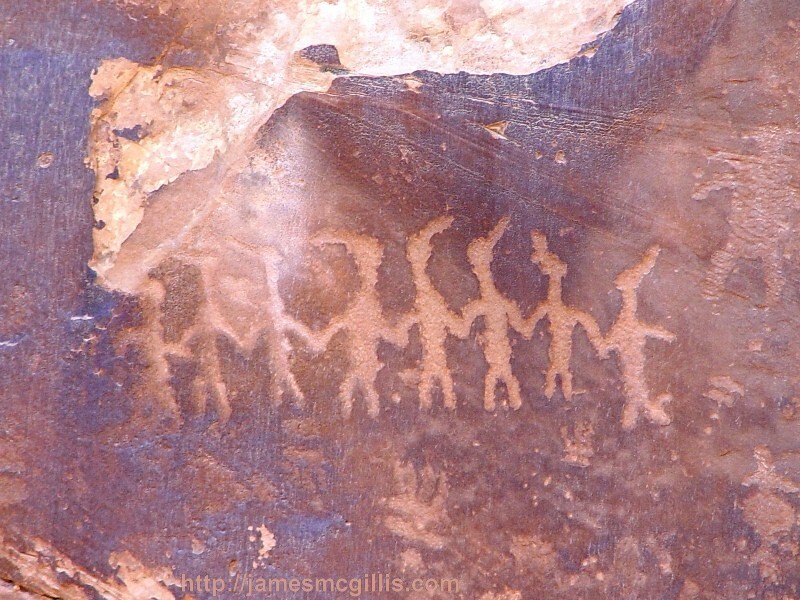 Our first stop featured several individual images of what we might call “little people”. Were these images of children, with cute, pudgy bodies or did they represent how the Ancients viewed themselves in the reflected light of Mill Creek? Next, Tiger pointed out a lone character that we call “Starman”, for each of his appendages ends in a star burst shape. 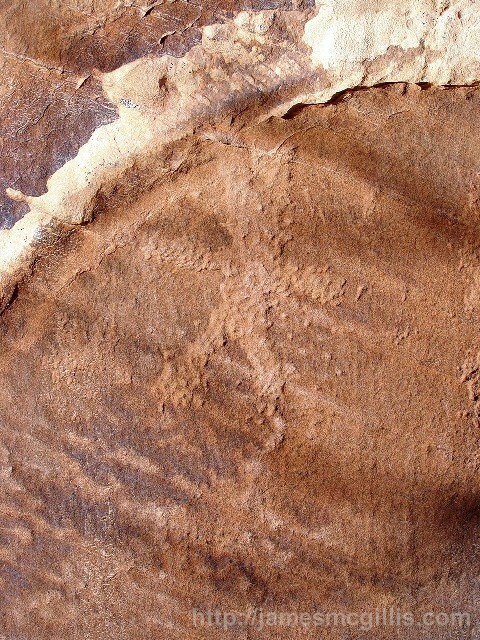 Did his maker etch a man in stone or did the artist wish to document the image of a constellation, visible in the night sky? We assume that star-hands and star-feet do not indicate that the Ancients had webbed feet. But then again, one man's lizard is another man's extraterrestrial. Next, we came to a prominent image, set close to the trail. It was of a man and two dogs, out for a hike in Mill Creek Canyon. A lone Ancient relieves himself from the canyon rim. His depicted stream of urine arcs gracefully toward the bottom of the canyon. The dogs appear to frolic nearby. Apparently, the Ancients had a whimsical side, presaging comic book art and humor by thousands of years. Next, we encountered images so ancient and unusual that we could not determine if they were humanmade or of natural origin. 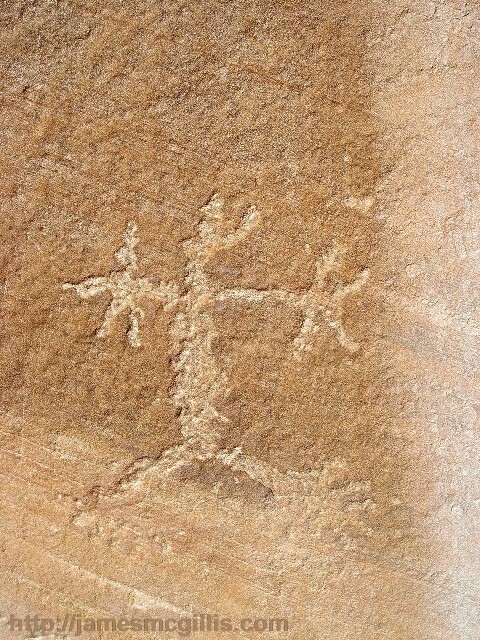 Petroglyphs or not, desert varnish had re-glazed them since the time of their inception. As with so many images that we come across in the area, it is often difficult to determine the age or origin of what we see incised in stone. As with beauty, this art was is in the eye of the beholder. Our next rock art visitor was a snake, showing himself on a sunny wall. He appeared to be watching over his own little Garden of Eden. His maker designed his ziggurat shape to stand out along the trail. Was this an early signpost that warned of rattlesnakes, or was it a celebration of nature, right down to the serpent’s tongue, still wagging after all these years? Our final rock art visitors on our downstream leg were striking and unique. Like a child’s daisy chain of cutout paper dolls, this group of Ancient friends posed, hand in hand. As striking as their ageless gesture of friendship was to us, their setting was even more awe-inspiring. 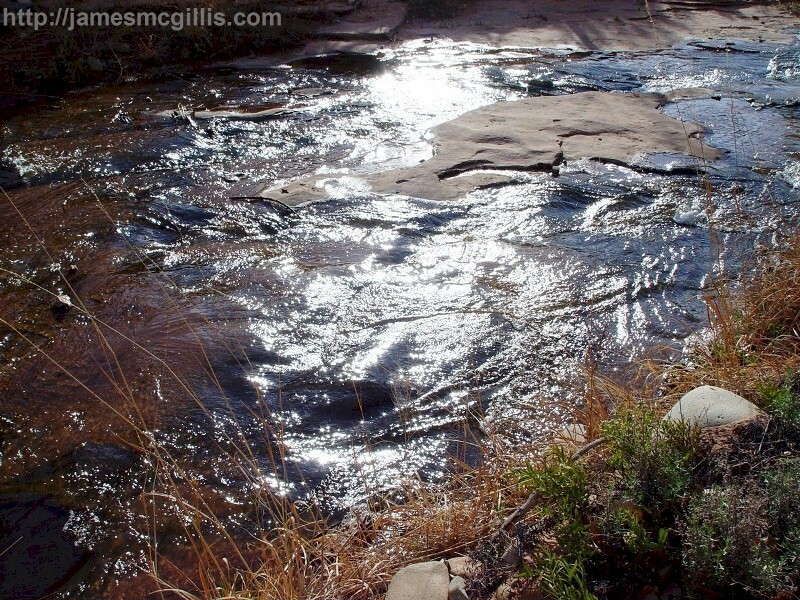 Above their heads was a perfect image of the La Sal Mountains, from which this stream arises. With its sun rays showering down above our rock art friends, we asked ourselves again, did humans create this part of the tableau, or did Mother Nature add the mountains and sun rays in the intervening years? Either way, it is a shrine to both nature and friendship. After only a decade or two of cattle grazing, many stream beds in the West have gone from pastoral to arroyo, meaning "dry canyon". 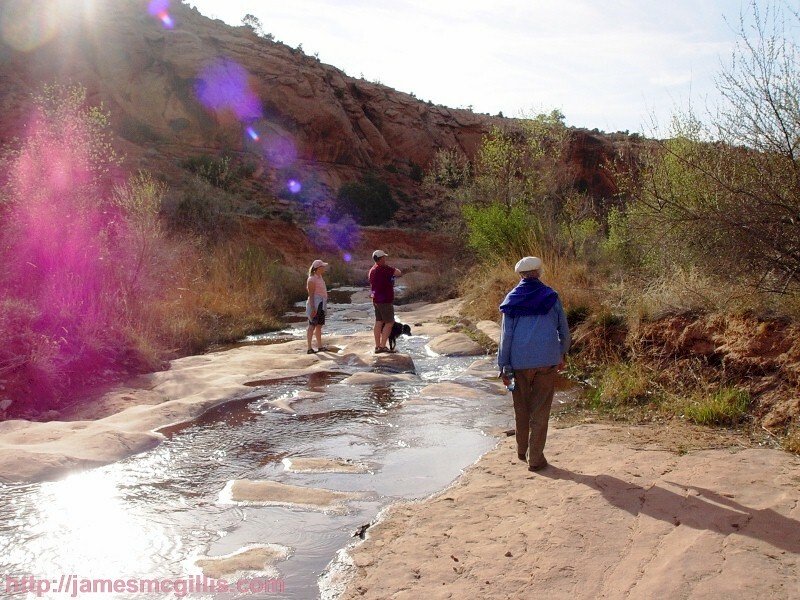 Kanab Arroyo, near Kanab, Utah is a perfect example. After only a few years grazing and wood gathering along Kanab Creek, an 1885 flash-flood created stream terraces along the formerly flat canyon bottom. Once a stream becomes a gully, it cannot repair itself. 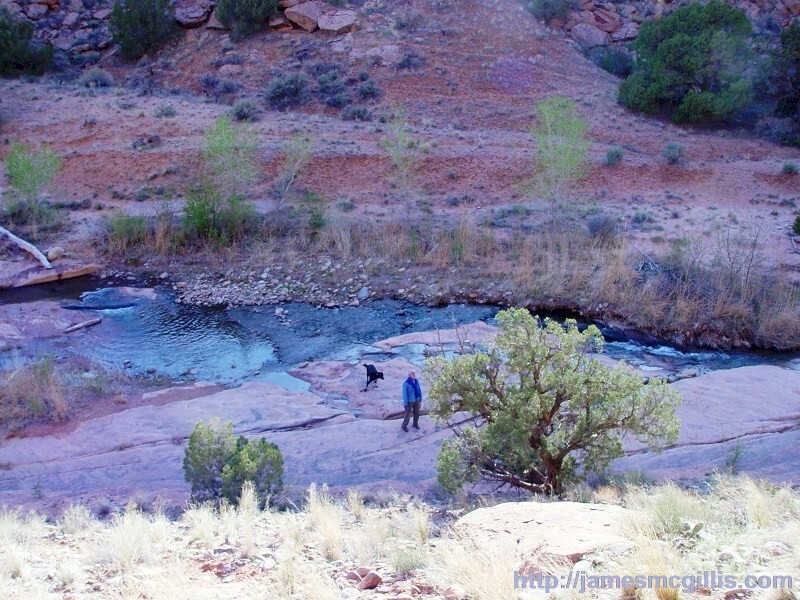 Along our hiking path, Mill Creek has a slickrock underpinning of hard Kayenta Sandstone. That solid foundation makes it less likely that the inevitable flash-floods will dig any deeper into the canyon floor. Thus, Mill Creek retains a timeless and idyllic look, despite many years of cattle grazing in the area. 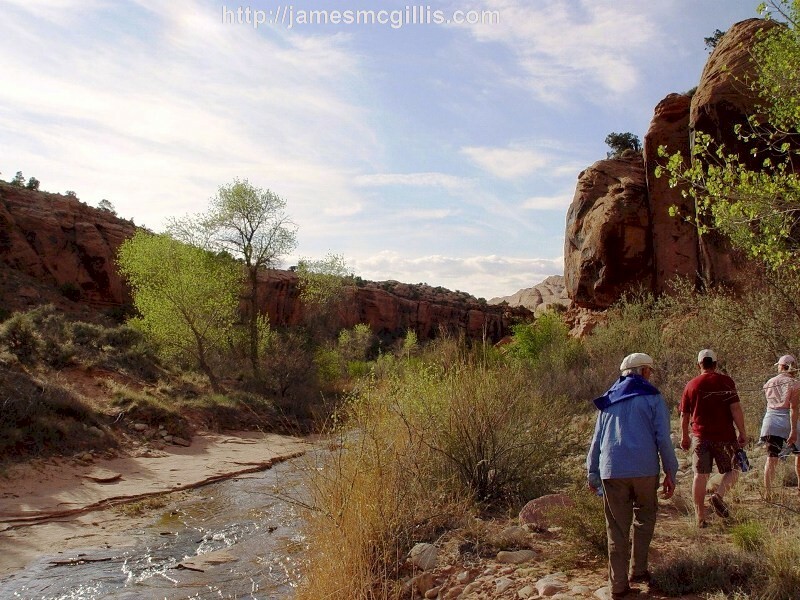 In terms of geologic time, the overlaying Navajo Sandstone that forms the canyon walls in this area may erode quickly, but during the lifetime of the average human, little changes along the middle stretch of Mill Creek. Unlike Kanab Creek, which once had rich deposits of alluvial soil, the stone floor of Mill Creek Canyon is too tough to rip up and wash away. Especially during each year's monsoon, flash-floods do visit Mill Creek. The larger floods can wash away soil and plants, but in this a desert watershed, mature plant communities coexist in deep pockets of soil that often overhang the streambed, itself. In March or April, snow-melt in the upper reaches of Mill Creek adds to the lighter winter flow, yet our group easily forded the stream at several points along the trail. For us, this visit included views of cottonwood trees leafing-out and wildflowers growing in sunny spots along the trail. In the summer, Tiger told us, the snow melt increases and creates natural water-slides, some of which become many yards long. One natural water-slide ends near a swimming hole that would soon be five feet deep. The warmer temperature of both the air and the water during the summer, made this the natural place for Moab kids to play and swim. The energy exuding from Mill Creek Canyon is of tranquility and peace. It is a place to nurture the spirit and the soul. If one stops there for a moment in the afternoon sun, new energy coalesces. Sunlight refracts in the lens of our camera and through the lenses of our eyes. Perhaps because of the glare, these energies are difficult to see in nature, but easy to see in a photographic image. Having previously experienced such anomalies near Moab, we were not surprised to see Tiger, Terry and Leo each bathed in new energy at Mill Creek Canyon. Intuition tells us that running water facilitates the rejuvenation of many life forms, including humans. Whether it is the crashing of the surf in Kaua’i, Hawaii or the burbling stream that we call Mill Creek, the sound of running water is primal to us all. If we allow the sun, wind, water and spirit to travel with us, they will guide us on our path, as they did on that late spring day. After scaling a talus slope within the canyon, we stood at least fifty feet above the streambed. Looking down, we saw only Leo. Tiger and Terry had disappeared. Smiling, Leo looked back up at us. With his vast experience in life, Leo’s look combined curiosity, concern and awareness of his environment. Without words, he seemed to say, “How are you doing up there? Could you take a picture so that we can remember our presence here?” Since Leo asked so much with just a look, here in words and pictures, I gladly document our visit to Mill Creek Canyon. Read Part 2 of my Mill Creek hike. ©2008 MoabRockArt.com. All Rights Reserved. 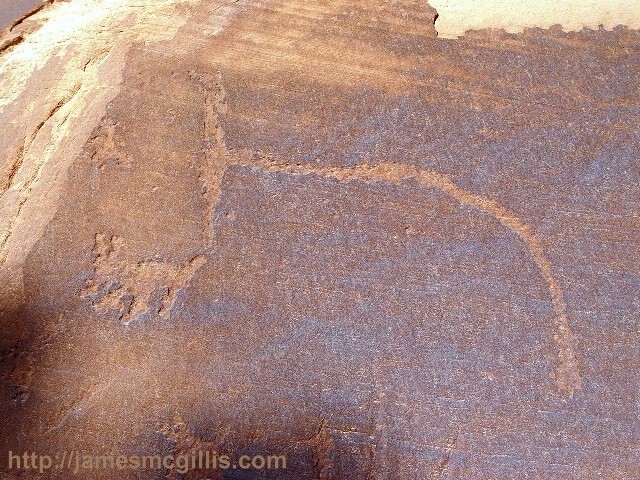 This Moab Rock Art news.